Rosemont Hotel and Residences is a five-star hotel and apartment project being developed by ZAS for Hilton’s luxury hotel line Curio in Dubai. Image courtesy of ZAS Group. The design for the two-tower Rosemont Hotel and Residences project was selected through an international completion. Image courtesy of ZAS Group. The star attraction of the building will be a 12,000m² artificial beach with a rainforest-like landscape on the top floor of the podium, providing water activities for vistors and hotel guests. Image courtesy of ZAS Group. 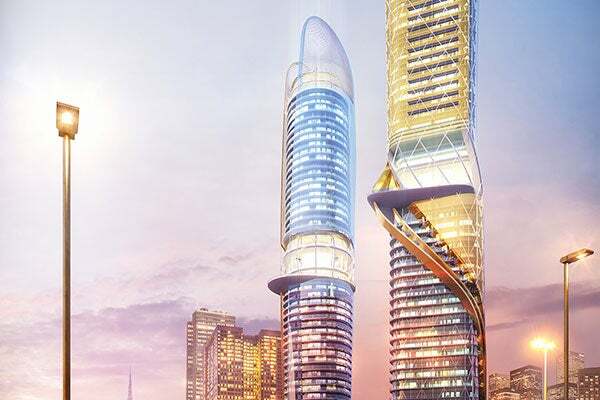 The project will comprise two towers consisting of 47 storeys, a shared five-storey podium and two basement levels. Image courtesy of ZAS Group. The building has been designed to echo the modern and urban feel of the city. Image courtesy of ZAS Group. Rosemont Hotel and Residences is a five-star hotel and apartment project being developed by ZAS for Hilton Worldwide’s luxury hotel line Curio in Dubai, UAE. The $300m project will be located in Al Thanyah First on Sheikh Zayed Road, and will be the first Curio hotel in Dubai. Four Seasons Hotel and Private Residences is being developed on One Dalton Street by Carpenter & Company. The project is a result of an agreement between Hilton Worldwide and Royal International, and is scheduled to be completed by 2018. Projects by Curio include hotels that mimic the culture and character of the destination city. The new hotel will feature an artificial beach and a rainforest-like landscape development. The design for the two-tower Rosemont Hotel and Residences project was selected through an international completion, and includes 450-guestrooms and 280 service apartments that will be constructed on approximately 170,000m². The towers have been designed to echo the modern and urban feel of the city. A common podium for the two towers will act as a pedestal and open up into the street. Both towers will extend more than 47 storeys and include a shared five-storey podium and two basement levels. They will be constructed on 106,000m² of the total construction area that will comprise the hotel rooms, sky lobby, sky pool, restaurants, spa, health club and meeting rooms. A state-of the-art guest experience will be built more than 45,000m², while another 52,000m² will be occupied by 280 service apartments fitted with their own sky lobby, sky pool and exclusive residential amenities. The podium will house exclusive retail outlets, a sheesha café, and breathtaking entrance and lobbies. A sky lobby on the 22nd floor can be accessed by visitors via express elevators, and will be surrounded by a sky pool, which will feature a grand pool deck and a pool bar. Restaurants will offer exquisite views of the city from the sky lobby, and a surface-mounted ordering facility will be available at the guest tables to add to the experience. In all, the development will feature three restaurants, a lobby café and two bars. The sky lobby will be connected to a spa and health club facility. A 7,000m² entertainment complex located on the top floor of the podium will feature a bowling alley, a skydive simulator, kids play area, a private luxury cinema and food court. The hotel will also feature a nightclub, which will be located on the podium’s first floor. Parking will be provided on the upper levels. The star attraction of the building will be a 12,000m² artificial beach with a rainforest-like landscape on the top floor of the podium, providing water activities for visitors and hotel guests. Offering comfort and ease to business travellers, the hotel will include four meeting rooms, two boardrooms and a multi-functional space for hosting meetings, conferences and events. Décor of the hotel rooms will comprise colour-themed floors. The hotel will offer a combination of standard / executive rooms and suites, including royal suites equipped with a smartphone access card. Guests and visitors of executive floors will have access to an exclusive executive lounge. "The new hotel will feature an artificial beach and a rainforest-like landscape development." The apartment tower will consist of 280 high-end fully furnished apartments, decorated to create a ‘home away from home’ feeling for the guests. A separate sky lobby with access to a reception and check-in facilities will be available for the residential tower, along with a lobby lounge and café. Amenities including a sky pool, pool deck and bar, and health club will be available for residents. ZAS Group of Companies is responsible for designing and developing the project, as lead consultant. Kieferle & Partner are the architect of record, while the main contractor for the project is Civil Engineering and Contracting (CIVILCO).